Tech News is a weekly tech newsletter delivered on your talk page and translated into many languages. 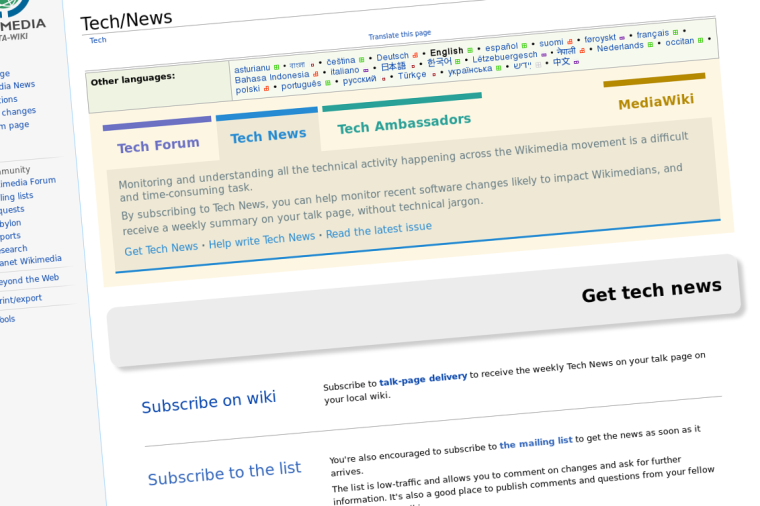 If you’ve ever wanted to be kept informed of technical changes likely to impact your Wikimedia experience, you’ll want to subscribe to Tech News, a weekly newsletter than can be delivered directly to your talk page. The amount of technical activity happening across the Wikimedia movement as well as the number of different discussion venues make it increasingly more difficult and time–consuming to monitor changes relevant to one's involvement in Wikimedia projects. Understanding technical issues and discussions is especially hard since they contain a lot of jargon terms and are mostly conducted only in English. Tech News is intended to make it easier to keep track of such noteworthy changes and understand them better. By using jargon–free language, we aim to reach regular Wikimedia contributors who are most likely to be affected by upcoming software and configuration changes. The newsletter is assembled by Tech ambassadors, a group of technically-minded volunteers who help other Wikimedians with technical issues, and act as bridges between developers and local wikis. They're the ones who monitor technical changes across numerous (and scattered) channels and put together the high-level, plain English summary. Volunteer translators are the other unsung heroes of Tech News. They've been doing an amazing job, which we are very thankful for: not only have they translated every issue so far into around 10 languages on Meta-Wiki (making the newsletter available for users speaking languages other than English), but their responsiveness has even allowed us to distribute translated versions of the newsletter to subscribers on their wikis. Four issues of the newsletter have been published so far, and the response has been overwhelmingly positive. Heartwarming comments have for instance described the newsletter as "clear, concise and useful info all in one." Readers have generally welcomed the initiative, and have provided feedback that helped us further improve the format of the newsletter. The Wikipedia Signpost has already started making use of Tech News, and we're hoping that, along with their counterparts in other languages, the Signpost writers will join forces with us to monitor technical changes. There are a few ways in which you can contribute to Tech News: by translating the latest issue into your language, adding relevant information or links to the next issue, or just by sharing the news with your community. If you'd like to subscribe to Tech News, add your username to our global delivery list or sign up for the wikitech-ambassadors mailing list to get more frequent updates. If there is local consensus, it's also possible to receive the newsletter directly on your local community discussion page. Originally published with Tomasz W. Kozlowski on the Wikimedia Tech blog.